A View of ye Jason Privateer, Nicholas Pocock, c1760, Bristol City Museums. The Jason was a Bristol slaver, and an old one by the time she began the slave trade. Built in 1716, she made at least five voyages to various ports along the West African coast, embarking approximately 1,500 Africans. Of these, a little under 200 died in the Middle Passage. She was commanded by a different captain on almost every voyage, and her last voyage was commanded, at least in part, by Captain John Brackenridge. Years later, Nicholas Pocock was commissioned to depict a series of Bristol slavers, all of whom were captained by Brackenridge at some point. It is likely that Brackenridge was the one who paid to have his various commands laid down on paper by Pocock. It is possible that, unlike the Blandford and Southwell, Pocock might have sailed on the Jason's voyage to Africa, as he was thirteen years old when Brackenridge took command. I am inclined to think he did not sail on the Jason because his depiction does not appear to be that of a Bristol slaver, but rather a warship. Jason is positively bristling with cannon. This makes sense for a privateer, as the title suggests, but means there is limited space for taking on the hundreds of enslaved people they intend to sell. There is also no barricado, a distinctive feature of slave ships. Pocock shows the Jason flying the white ensign, a flag that is supposed to represent a Royal Navy vessel. This is not necessarily an error. 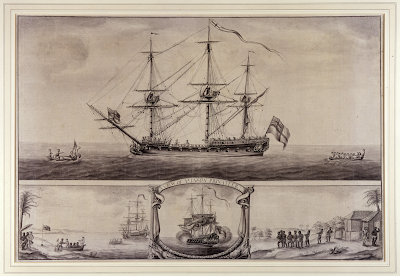 Merchant vessels are sometimes depicted flying naval ensigns, including slave ships. This could be, as often was the case in the eighteenth century, a ruse to scare off enemy vessels. It could also be a mistake on the part of an artist who is not familiar with the meaning of the various ensigns (red, white, and blue). Gathered at the foc'sle head are a number of tars. They are clad in a mix of barge caps and cocked hats, some of which are reversed. One of the sailors holds either a sword or a stick. He wears a cocked hat, single breasted jacket that appears to have slit cuffs, and a pair of trousers. Further aft, more sailors in cocked hats and barge caps work to the sound of a trumpet, while an officer standing larboard of the mainmast shouts commands through a speaking trumpet. One man working beside the mizzen might be wearing a scotch bonnet. One of the small boats is populate with a few tars. One of them sits astride a cask. He wears a cocked hat with the point forward, a single breasted jacket with mariners cuffs that ends about the top of the thigh, and a pair of trousers that end at the bottom of the calf. His neckcloth is short and plain. The coxswain wears a cocked hat, jacket, and bob wig. The two sailors wrestling with the disobedient sail in the bow are wearing a round hat with very narrow and upturned brim, and a barge cap, respectively. An officer, presumably the captain, sits in the stern of the Jason's barge. His hand is tucked into his jacket, and another two gentlemen sit with him. The coxswain and oarsmen all wear shirt sleeves and barge caps. Ashore, a gentleman with a cane stands under the shade of a parasol. He may be the slave dealer who secured the unwilling Africans for the dreadful Middle Passage. 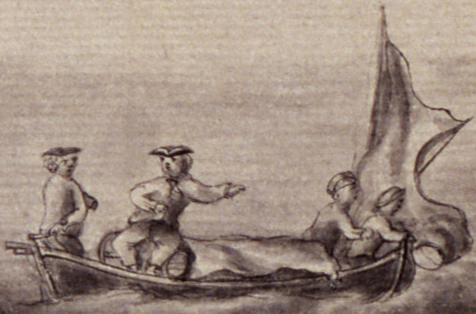 The coxswain of the boat onto which their captives are to be rowed to the Jason is wearing a cocked hat, smock, and trousers. The two men pulling an African over their bow wear trousers and jackets, with a barge cape and what might be a scotch bonnet. Interestingly, the man standing on the shore appears to be barefoot. This would be one of remarkably few images to show sailors working without shoes. 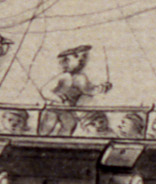 In the final detail, we see a man (possibly the captain, given his mariners cuffs and reversed cocked hat) speaking with an African armed with a spear. The man gestures toward the enslaved men who are bound together and under the watchful gaze of an armed guard. As I've said in the past, what strikes me about depictions of slave ships and their crews are that the sailors are entirely indistinguishable from naval and merchant sailors. Even as a laboring class, common tars were just as culpable in the sin of transatlantic slavery as anyone else.